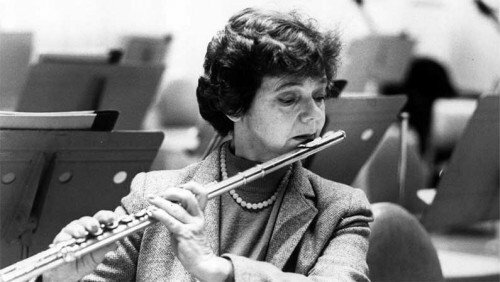 The first woman to hold a principal chair in a major American orchestra, Doriot Anthony Dwyer played principal flute for the Boston Symphony Orchestra for thirty-eight years. Leonard Bernstein called her a genius. Considered one of the top orchestral flutists in the world, Doriot appeared on dozens of recordings with world famous conductors. But getting there wasn’t easy. At the age of eight, Doriot began studying flute with her mother. One day she heard a Chicago Symphony performance on the radio. Inspired by principal flutist Ernest Liegl, Doriot made up her mind to become an orchestral flutist, a dream her mother encouraged. Doriot’s father was a cousin of Susan B. Anthony. Doriot’s mother admired the famous suffragette and told Doriot never to put herself down because she was a female. Precociously talented, Doriot began taking lessons with the flutist who had inspired her, Ernest Liegl, in 1934. Only twelve years old, she rose at dawn to take a four-hour train ride to Chicago, followed by an hour-long elevated train ride to Liegl’s studio. For five years, Doriot made this arduous journey twice a month. Liegl recommended further study, but he had little reason to expect that she would ever win an orchestral position. At that time, few major orchestras hired women, other than harpists. In 1939, Doriot applied to the Curtis Institute of Music, but she was rejected. That summer she attended the Interlochen Music Camp. Her fine playing drew the attention of Howard Hanson, director of the Eastman School of Music in Rochester, NY. He offered her a scholarship. At Eastman, she got a taste of the gender bias she would later encounter in the music business. During her four years there, she auditioned to play principal flute chair in the school orchestra four times. She never won. However, she did win the second flute position with the National Symphony in Washington in 1943. In 1946, she played principal flute in an orchestra for a touring ballet troupe. It was gratifying artistically, but the tour folded in Dallas. Seeking better opportunities, Doriot took a train to Los Angeles. 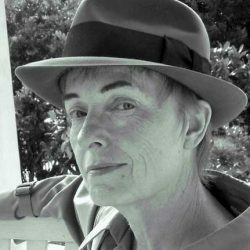 Six months later she was playing lucrative jobs in recording studios, primarily because she was a fine sight-reader, a skill she credited to her experience playing new music at Eastman. She auditioned for the second flute chair in the Los Angeles Philharmonic and got the job. Her big break came when conductor Bruno Walter appointed her principal flute of the Hollywood Bowl Orchestra, a challenging job with a concert almost every night of their 13-week season. Walter then chose her to play principal flute in a radio orchestra similar to the NBC Symphony. The repertoire was difficult, but it gave her valuable experience as a principal flutist, an experience she would soon need. Prior to the 1960s, orchestral jobs were rarely publicized. Many section positions were filled by students of the principal player. However, in 1952 the Boston Symphony Orchestra announced auditions to replace retiring principal flutist George Laurent. Doriot quickly sent in an application that she signed “Miss Doriot Anthony” to avoid any confusion about her gender. At that time, applicants were usually male musicians invited by the conductor. But Charles Munch decided to hold a “ladies day” audition. She went into heavy training. Here was her chance to fulfill her dream of playing principal flute in a major orchestra, and she wanted to play her best. For two months, she practiced for hours every day until she could play the audition music from memory. Nevertheless, gender issues arose. They asked if she planned to marry and have children. She did but told them it was none of their business. When they asked her to come back in two weeks and audition again, she refused. Two months later the offer came, but it said nothing about money. Told she would get the usual sum, Doriot asked for more and got it. “It’s a lot of money for a little girl,” said the manager. In 1952, Symphony Hall had no backstage facilities for women. The only other woman in the BSO, a harpist, offered to let Doriot change inside her harp’s hard case. Doriot declined and asked for a proper dressing room. The BSO management assigned one of the backstage rooms reserved for soloists to her. During her thirty-eight years with the BSO, Doriot won critical acclaim for her performances under famed BSO conductors Charles Munch, Erich Leinsdorf and Seiji Ozawa, and equally famous guest conductors Georg Solti and Leonard Bernstein. Many of these performances were recorded. In 1963, the orchestra established the BSO Chamber Players, principal players of the string, woodwind, brass, and percussion sections. Doriot was the only woman. In addition to concerts in Boston, New York City and at Tanglewood, the group toured widely and recorded for Nonesuch and Deutsche Gramophone. For many years, Doriot taught at New England Conservatory, Boston University, and the Tanglewood Music Center. Many of her students, male and female, won major orchestral positions after graduation. When Doriot decided to retire, the BSO commissioned Ellen Taafe Zwilich to compose a concerto for her. Doriot gave the premier performances of Zwilich’s Concerto for Flute and Orchestra in April, 1990. She continued to play recitals and to record chamber music for flute and strings for Koch Records. On April 30, 2012, she was inducted into the Rochester Music Hall of Fame. At age 90, she wowed the audience by playing one movement of Darius Milhaud’s Sonatine for Flute & Piano. At a time when few women played in major U.S. orchestras, Doriot Anthony Dwyer achieved her goal. Thanks to her prodigious talent, steely determination, and tireless effort, she became one of the top orchestral flutists in the world. At this writing, she still lives in the Boston area. You can watch Doriot perform with the BSO, conducted by Charles Munch in a 1962 performance: “Danse generale” from Daphnis et Chloe – Suite No. 2 Wait for the end to see Doriot get a solo bow! First Flute: The Pioneering Career of Doriot Anthony Dwyer, Kristen Elizabeth Kean, submitted in partial fulfillment of Doctoral Degree, LSU, 200. Tanglewood 1985, Boston Symphony Orchestra publication, 1985. “A farewell to the BSO’s magisterial flute,” Richard Dyer, Boston Globe, April 22,1990. “Doriot Anthony Dwyer still seeking out new challenges,” Richard Dyer, Boston Globe, December 12, 1994. See photos and an expanded article here. 3 Responses to "Doriot Anthony Dwyer – Flutist with Attitude"
What an awesome career. I will try to find out more about Doriot and her music. Thank you for sharing this article. As an acquaintance of Doriot’s, I once asked her if she thought our son Steve should go into music. She said “only if he has to.” She knew what it took—and she took it. She is an inspiration for all those young musicians who aspire to greatness. Steve did go into music. The definitive recording of Daphnis et Chloe was with George Laurent flute solo and conductor Serge Koussevitzky and the BSO.